From hiring managers to bosses, managers to coworkers, clients to peers, all form views and opinions on you, from your behavior and the experience that they had with you. It can be by means of social networking or in person or from what they have heard about you. When they see, you have a strong and compelling value, they are probably going to hire you or engage you in something or make relationships or dealings with you. Thus it is important to take a proactive approach to manage your professional reputation and the way people perceive you. 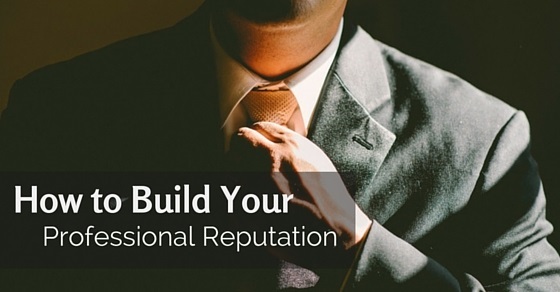 Below are steps that will guide you to build perfect professional reputation that you need. Assess your existing reputation. The factors that you need to evaluate will be how you are known, how others perceive you and your value, analyze the feedbacks that you receive, good or bad, encouraging or for improvement etc. You need to vision and contemplate about what reputation you would prefer to have. You must learn what you want to be known for and what you would like to be called as. For example, you might want to be known as a problem solver, passionate for his work in a particular profession. You must plan up a strategy to direct your actions, networks and ideas towards your desired self image. You must always keep the focus on the people in your industry and that they should find you relevant, so that you get closer to different opportunities. You need to build goals and milestones and take into account all of the mediums through which you will be able to promote yourself. You cannot just hope that the people in your industry will recognize your value and appreciate you. You need to make efforts to install yourself with messages and your behavior which will cause them to see your relevance. Utilize all the possible mediums through which you can position yourself. Look for relationships and networks that are rewarding. Always measure your actions and pursue what best works for you. As you are positioning yourself to market to the people in your industry and build a reputation that you desire, list out resources, reputed people from your industry and supporters to help you in your journey. It is easy and natural to be polite and kind to your seniors or head of the company, in any case, all manage to do that. But you need to treat others in the organization in the same manner. Be it your coworker or someone who sells you food items in canteen, show kindness and respect to all. You must always keep your promises on anything. Do what you said you will carry out, before whatever timeline you agreed upon. It could be completing a project or getting back to someone for something they asked, giving feedbacks to someone on a project or introducing a person to your networks. People will know that they can count on you. It may seem easy but there are many distractions that people get involved in such as checking in on social networking accounts or texting or picking up phone calls, during work hours. You truly will stand out if you avoid such distractions and work intensely. It doesn’t mean you cannot answer personal calls during lunch time, however implies that you work hard during your working hours. Some people do not go beyond what is expected of them just because they are not being compensated for doing something apart from their basic roles and duties. However when you frequently go beyond the least, you generally get incentive for it in the long run. When you work more than you are expected to, your company will recognize and accordingly reward you. Or either you will be recognized in the next company that you join in. The enhanced reputation by going above and beyond will attract job security, higher remuneration, and better projects. Helping others is a strong method in building reputation, without expecting anything in return. You must spot ways you can help your coworker or others in the organization or in your network for assistance on a project or advising someone for their resume. When you are generous to help others, it strengthens your relationship with them and you become their valuable resource. It is natural to have biases at work but if you hide those from the people at your workplace, you are harming your credibility and can even destroy it completely. You must acknowledge and let people know what part you really like before objecting so that you get more credibility and people can rely in what you say. The people who are great at carrying out work usually like to know where they could get better even more and are not apprehensive in knowing that they have room for improvement. When you ask for feedbacks you not only show confidence in what you do but even demonstrate that you are modest enough to wish for improvement. It is even a way for you to learn to be better at what you do. You need to, at all times, be professional even if you are annoyed or irritated. You cannot lose temper on a colleague who has been bugging you or a difficult client. One such move can bring down all your efforts of years to have a perfect professional status. It is a digital world and it becomes important to manage your online presence and what comes out about you online. Research has established that prospects make major decisions by searching online for details to ease their concerns. Thus optimize your LinkedIn account and make sure the first Google page is precisely influenced by you. Engage and be part of the conversations with focus on relevant topics to your industry. You need to stand up and define your significance, remember it is you who can define your slot. Seek for opportunities where you can speak to public of your organization or business groups, or try to engage with your appropriate professional organization. It adds value when you educate a group of people about your profession and demonstrates your expertise. It can be through means of blogs or writing books or by uploading videos on how-to’s, of your profession. Avoid making it a pitch for your own self but help others with useful information. People will start perceiving you as the expert in what you do. Do in depth research when you face problem or if you are helping someone else with a problem. Genuinely put efforts with your skills and competence and solve the problem. Even if you eventually fail, your efforts will be observed by people and you will be respected for your attempts. If you succeed in solving the problem, it improves your reputation progressively. You must response to people on time, depending upon the urgency of the request. It is important to maintain a constant and regular communication with all the people. Institute a standard for communication with people that will show how approachable you are, how you tackle requests from people and maintain your networks. You need to complete tasks way before the deadlines and thus plan everything well before in time. When you will have the sense of urgency, you will give importance to each task and carry out things efficiently with your skills, so that you meet with the deadline. It shows your expertise in carrying out tasks quickly and will give you more exposure to big assignments and rewards in many ways. When a colleague helps you on a project, it will be a small gesture to write down a recommendation on your LinkedIn profile for that colleague. It is embarrassing to ask colleagues for their recommendation, thus you can take a proactive step and recommend others showing your respect for them and demonstrating how you value their work. It is very easy for a discussion on a significant project to turn into destructive conversation. However negativity in meetings and discussion can demotivate employees and create obstacles on the road to success. Maintain your focus and discipline and the colleagues and your manager will follow you and look for your leadership in further projects and consider you as evolving leader. Your opinion is precious to your organization as you were hired for your skills and effectiveness. Thus present your opinions with confidence. When you have a different perspective and believe that a current process can be changed, do not just question its ability but suggest and come up with a new process. Be smart when you go out with your colleagues or if your organization has held a party. Keep relationships professional and do not over share. Do not involve much with alcohol even if you find your boss drinking. You should never be in doubts about a company policy or something about a big project or even in some minor task. To stay unambiguous, ask questions and clear your thoughts. You should not keep nagging your boss with queries all day, but in the appropriate time, ensure you clear all your doubts. Join a networking group and on a regular basis attend to them. People like to make relationships and have dealings with people they have known before. Thus face to face interactions in such groups can be very beneficial for your reputation. Organize for every situation and be prepared. Before a meeting with someone, ensure you have their cell phone number. Always keep a pen and notepad to note significant things discussed in a meeting. Always carry extra business cards with you. To be punctual always ensure you leave early. Do your research on new contacts by checking their LinkedIn accounts and learn about them as much as possible, as part of your homework. To stand out from others, the best technique is to follow up steadily with the people you meet. Keep track of all of the business cards you receive and make notes on a new person you encounter that has relevance and significance in your industry. You might make commitments to send them an introduction, or an article or refer them a website. You need to follow up to keep your commitments in two to three days of time. It elevates your value in people’s minds. Contributions play a vital role, too for your influence on people. Volunteer for a cause you care about by providing them your services. When you volunteer for your expertise, everyone including your fellow volunteers will notice your skills and value. When you reach to as many people as possible to work towards community welfare, it can be beneficial to your overall professional reputation. Learn if your industry offers any kind of official recognition. With certifications you acquire confirmation for third party on your capabilities and it illustrates your dedication to professional development. Show your certificates at your office display it on your blog and business cards and even in your promotions. So you now have strong steps to put yourself ahead of your competition. If you execute the steps well then you will have strong referral association that will drive your professional reputation to the next level. Always remember to give back to your referrals and generate a trusted inner circle.